Nichole Chase: Springing Into Books! 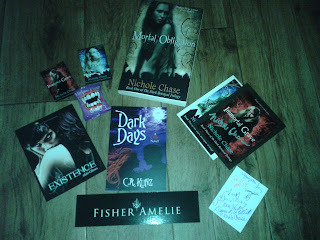 Mandie from eReadingonthecheap.com and Beckvalleybooks.blogspot.com are hosting a fun hop with lots of chances to win cool book related prizes. I decided to join in on the fun, because, well, I love to do giveaways! They are so much fun! Here's your chance! Fill out the rafflecopter below. Good luck and be sure to check out the other blogs on the hop. There are some great prizes to be won! My favorite thing about spring is that I was born in the season and the weather is usually always perfect. I also love the transition from winter to spring because all the colorful flowers start to bloom again! I love fireflies and the sounds that fill the woods at night! Let's not forget the beautiful purple, white, and yellow trees! I love the temp. It isn't too hot or too cold. It's just right. the longer hours of daylight! Watching my boys play baseball. I'm also pretty crazy about all of the flowers. My favorite thing about spring is when the flowers start to bloom and the tree's start getting their leaves. The weather! beautiful 70s with a breeze here. Is this open to Canadians? If so, please email me (swak50 at hotmail dot com). Regards. I love that I can wear sundresses because the weather is nice. The flowers are starting to bloom! The love the smell of the flowers that are coming in bloom, and The Sounds of the birds chirping. The warm sun shine washing away the cold winter air! Many thanks for the giveaway. I love the warmer weather! Being able to spend more time outside because it is warmer and the days are getting longer. Thankyou for the giveaway. Even though they kill my allergies I like the blooming trees and flowers.